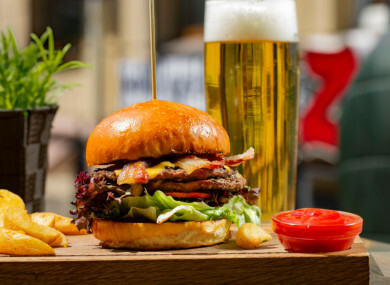 What food goes best with beer? Of course, our panel of home cooks didn’t disappoint. If you’d like to join, drop us a mail on food@thejournal.ie! WINNING TIP: A homemade burger and wedges: “I’d have to say, you can’t beat my homemade burgers and potato wedges! The burgers are my Mum’s recipe and, to be honest, I haven’t changed them a bit since she used to make them when we were kids. They have round mince, breadcrumbs, egg, onions, seasoning, herbs and a beef Oxo in them. They are so light and not at all like some of the dense burgers that can sometimes just sit in your tummy (and not something you want to pour a beer in on top of!). Scampi and chips (with beer batter): “Ice-cold beer is a joy at any time but when paired with delicious food it becomes an even greater pleasure.My favourite pairing is freshly made Dublin Bay scampi, crispy twice fried chips, a dollop of homemade mayonnaise… and all washed down with a cold beer. Any kind of curry: I think nothing beats a cold beer with a curry, be it Thai or Indian. Congratulations Olly Keegan, whose recipe for home-made burgers and wedges was the winning tip this week. A €250 Lidl voucher is on its way to Olly. If you’d like to join the Home Cooks Panel, just email food@thejournal.ie. To learn more about Lidl’s winners at the Great Taste Awards, click here. Email “Kitchen Secrets: Our readers' favourite foods to eat with beer”. Feedback on “Kitchen Secrets: Our readers' favourite foods to eat with beer”.